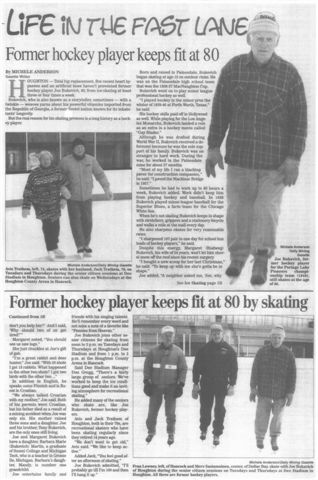 Ralph Bammert, from the Calumet area has been a volunteer in the Calumet Hockey program, Michigan Amateur Hockey and USA Hockey programs for over 30 years. 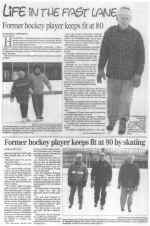 He started as a Team Manager in 1968 and became Secretary of the Calumet Hockey Association and Secretary/Treasurer of U.P. Hockey Association from 1972-1992. 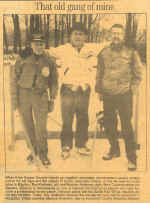 He served on the Michigan Amateur Hockey Association (MAHA) Board of Directors 1981-1987 and President of MAHA in 1987. He received the MAHA Appreciation Award in 1987, then in 1988 he received the William Kellogg Award for outstanding achievement and dedication to amateur hockey. He was elected as a Life Member of MAHA in 1996. Ralph became USA Hockey Registrar for Michigan in 1987, a member of USA Hockey Junior Council 1987-1990 and USA Hockey Youth Council since 1990. He has been a Counselor for USA Hockey Development Camps 1981-1988, USA Hockey Camp Director 1989-2002, Team Manager at the USA Hockey Olympic Festival in 1991 and Team Leader for USA Hockey National Teams 1992-2002. He initiated the USA Hockey Bantam Development Camp for the Michigan and Central District in 1986 and continues as Camp Director . Clemeth Banfield, (1917-99) a Dollar Bay area businessman, Clem was a President and long time member of the Copper Country Junior Hockey Board and one of the key people that got local youth hockey off the ground. Clem was very generous and paid for many local players to play sports. 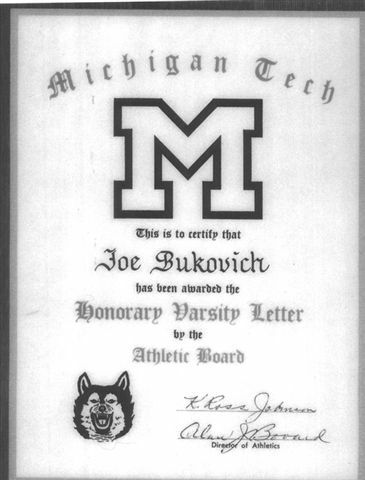 He helped found the Michigan Tech Huskies Club with Herman Gundlach and Jack Howard in 1956, and was inducted into Michigan Tech's Sports Hall of Fame in 1989. 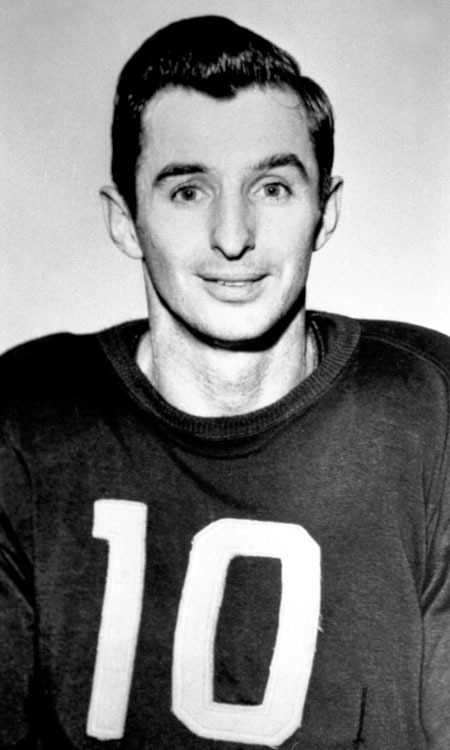 William A. Fred Barry, (19--to1988) was born in -- a Calumet native, "A standout in football, hockey and baseball, Calumet native Fred Barry was regarded by many as the best all-around athlete in the Copper Country during his career. 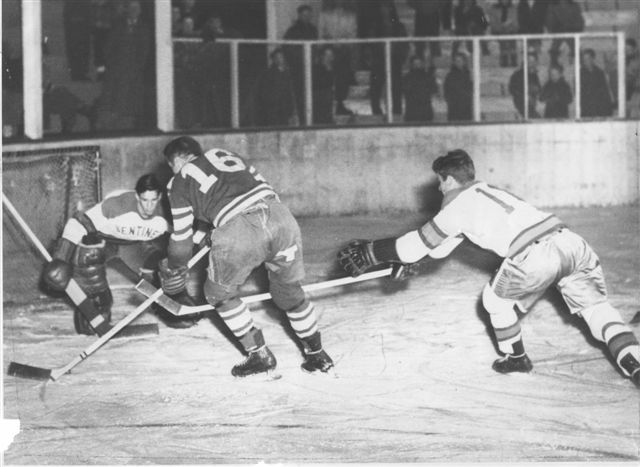 He received a football and hockey scholarship to Michigan Tech but left school after his freshman year to play semi-pro hockey, helping the Portage Lake Pioneers win the Gibson Cup in 1953 and the U.S. Senior Men’s national title in 1956. He twice led the CLK Wolverines to the Gibson Cup. He was invited to baseball tryouts with the Kansas City Athletics and New York Giants and played in the Copper Country Twilight League and fast pitch softball." He was inducted into the UP Sports Hall of Fame in 2004. Jim Baudino, born in Calumet?, in 19--, played hockey for Calumet High School and CLK teams in the 1920s-1930s. 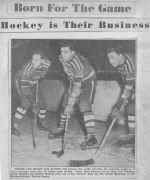 In the early 1930's, he moved to Detroit to play hockey "along with other Calumet area 'boys' Joe Elenich, Art Koski, Rudy Zunich, Wes Lampsa, Al Geshel, Matt Wiljanen and Francis Ruelle". 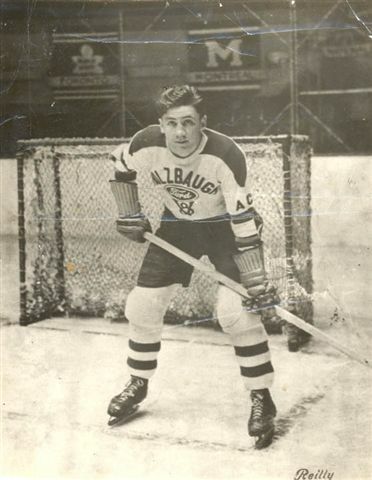 He played for Detroit Holzbaugh team 1937-41; with the Toledo Babcocks 1942 and 1943 seasons, both in the Michigan-Ontario Hockey League; and the Detroit Auto Club 1945-49, and the Auto Club Ryancretes 1949-50, both in the IHL. News & photo courtesy of Jim's gr-dtr Jeanne Berlin. Eric Bausano, born 1984 in Calumet?, Mi, played hockey for the Calumet High School team then played AAA Midget Hockey with the local Ojibwa Eagles 2002-03. He played the 2003-04 with the Laconia Leafs, IJHL where he lead the league in scoring and was named IJHL MVP for the season. He split the 2004-05 season with the Cleveland Barons, NAHL and the New Hampshire Jr Monarchs, EJHL; scoring 14-8-22 in 52 games. 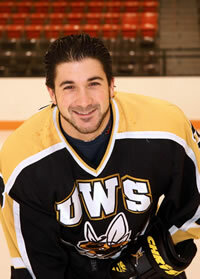 He played DIII college hockey, NCHA with UW-Superior, four seasons: 2005-06, 2006-07, 2007-08, 2008-09. Justin Bean, born 19-- in -- a Hancock High School hockey player -1999, plays for the local Finlandia University Hockey Team. need pics in uniform here! Herb Boxer, born 1947 in Hancock, Michigan. 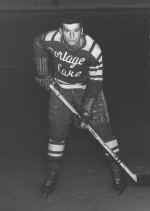 Herb was a standout in the Copper Country Jr. Hockey Association and played for the Gundlach Bantam's, Dollar Bay VFW Midget's and the Laurn-Grove Juvenile's. The 1963-64 Laurn-Grove team won the National Juvenile Championship. Herb went on to play for Michigan Technological University for three seasons 1967-70. In his three seasons at Tech, Boxer totaled 37 goals and 36 assists; including a team best 24 goals and 14 assists in his senior year. He participated in the NCAA Final Four Hockey Championships three times; including as a player and a coach. After college, he declined an invitation to the 1972 USA Olympic Hockey Team and signed a professional contact with the Detroit Redwings. Herb Boxer was the first American born player ever selected in the NHL draft! 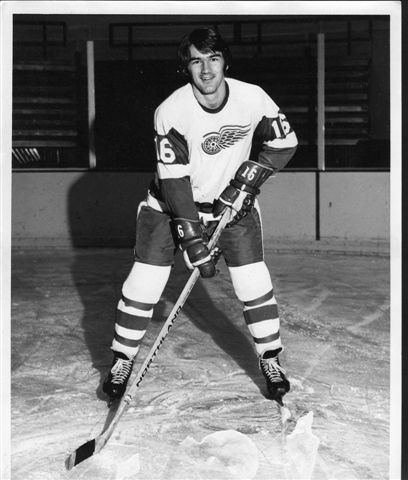 He was a 2nd round #17 pick of the Detroit Red Wings in 1968. He played 5 seasons of Professional Hockey 1970-75. He was a member of USA Hockey National Team and team captain, in the 1975 World Championship, in West Germany. In 1975 Herb retired as a professional player and began his coaching career. From 1976 to 1985 he was an assistant coach at Michigan Tech, under John MacInnes. For five seasons 1985-90, he was Head Coach for Michigan Tech and was voted WCHA "Coach of the Year" in 1987-88. He was also Director of the Michigan Tech Hockey Development Center from 1976-1990. From 1991-1994 he worked as a Scout for the Quebec Nordiques. He then coached 4 years with the Memphis RiverKings of the Central Hockey League (1994-98) and led them to the Eastern Division Championship (1996-97). In addition to his collegiate and professional coaching experience, he supported USA Hockey in the following capacities: Assistant Coach, USA World Junior National Hockey Team, 1977-1980 (World Junior Championship), Head Coach of Team North in the 1982 National Sports Festival (team won Gold medal). Member US Olympic Ice Hockey Committee 1984, USA Hockey Camp Director-USA Hockey Camp (ages 15-16), 1984-1988. Boxer is now a recruiter for Cook Systems International in Memphis, and says he stays close to the game because of the involvement of his two sons, Jay and Marc (who are highlighted below) and also now watches his four grandchildren who are all involved in junior hockey. Herb explains "there are many individuals that supported me in my development throughout my career as a person and a hockey player, they include Joe Bukovich, Bill Barstow, John MacInnes, Dan Farrell, Dave Draper, Paul Coppo, Bob Hauswirth, Merv Klemett, Joe Houle, Fran Lowney, Gordon Barkell and Harold Messe in addition to my teammates and my family." Jay Boxer, born 19-- in -- a Hancock High School hockey player, including the 1987 State Runner-Up team in his senior year. Jay, a son of Herb, went on to play two seasons for Michigan Tech 1988-90; he then coached 4 seasons in the USHL 1993-98. Jay is the coach of the Ashwaubenon, Wisconsin High hockey team and is also involved in junior hockey circles in the Green Bay area. Marc Boxer, born 19-- in -- a Hancock High School hockey player, including the 1987 State Runner-Up team in his sophomore year. Marc, a son of Herb, went on to play 4 seasons at Miami University, Ohio 1991-95 and played semi-pro hockey for 4 seasons 1995-99; he was Asst. Hockey Coach for Michigan Tech 2 seasons 1999-01. Marc now works with USA Hockey in Colorado Springs as Coordinator of Youth Hockey Programs. Harry Bright, born 19-- in Winnipeg, Manitoba, played on the 1905-06 Portage Lake Professional team. A Harry Bright also played for the Montreal Shamrocks in the 1902-03 season. 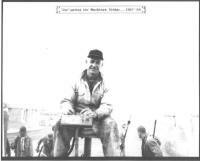 Peter J. Buchmann, born 19-- in --, played 3 seasons for Michigan Tech and captained the Huskies' hockey team during the 1958-59 season. He went on to play hockey with the semi-pro Green Bay Bobcats from 1959 until 1965, and coached the Bobcats from 1965-70. He was also an assistant coach of the U.S. National Team during the 1969 World Games in Stockholm, Sweden. He has coached youth hockey in Green Bay, Wisconsin, for over 15 years. Buchmann was the director of the annual "MacInnes Memorial Classic" alumni hockey game which was played each year from 1972 to 19?? during the Alumni Homecoming. In 1982, her received the Bob D'Alvise award for his contributions to Tech's hockey. 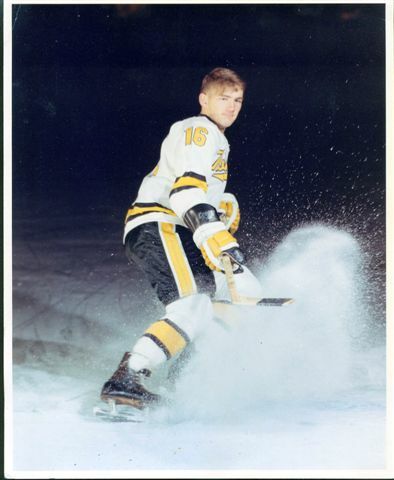 Peter was inducted into the Michigan Tech Sports Hall of Fame in 1987. Joseph Toney Bukovich "Jo Buk" aka "Eggs" (Nov 16, 1920 to January 4, 2007) Born in nearby Painesdale, Michigan, Joe started skating when he was 7 years old. 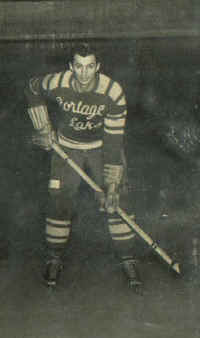 His first organized hockey was playing for the Painesdale Pontiac Chiefs at the age of 16. 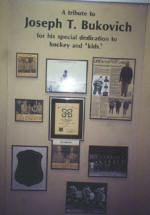 He played on the young Painesdale Panthers Athletic Club team that won the MacNaughton Cup in 1936-37. Joe was a fast skater who played right wing. 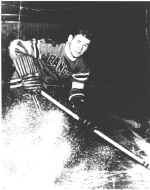 Joe played pro hockey with the Fort Worth Rangers in their inaugural season 1941-42 in the American Hockey Association. 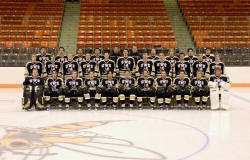 The Fort Worth team had their first training camp in Sault Ste. Marie, Michigan. They finished second in the Southern Division; their team & league was disbanded after this season because of World War II when travel restrictions, shortages and the draft were too much for a minor league to overcome. 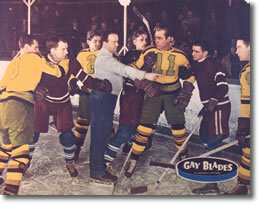 During the 1945-46 season, Joe played on the Los Angeles Monarchs team in the PCHL, which ended up landing him a position as an "extra" the winter of 1945, in one of the first full length hockey movies ever made, called the "Gay Blades" also known as "Tournament Tempo". The movie's story was about a big league hockey star who is spotted by a beautiful gal who was a movie talent scout. Actors in the movie included Frankie Albertson and Gene Rogers and Allan Lane. 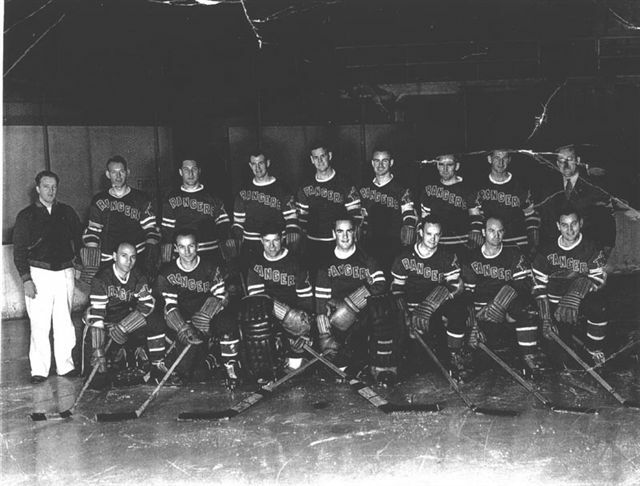 Joe, and other players on the Monarchs team, and former NHL players such as Bob Gracie, Ossie Asmundson and Alex Bud Cook, were the skaters and the skating legs of the actors in the movie. "Before a game, Joe would go on the ice and scrape down "his" side of the ice so when he got the puck in a game, he could skate real fast controlling the puck." In a 1948-49 Portage Lake game program, Joe was featured as the player of the week; it was written that "observers rated Joe the fastest man in the league last year" (he was out during the program's season, from knee surgery due to a baseball injury.) Joe skated with the Pioneers until 1955 before retiring from the game. Joe sharpened skates at his home for over 40 years since he got his first sharpener in 1959. In one day he sharpened 107 pair of skates for busloads of school teams who came to town. 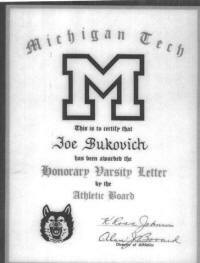 In the 1950's coach John MacInnes considered Joe the unofficial assistant hockey coach of the MTU Huskies. He would take the puck and play keep-away with the players: he would tell the kids "bring your own puck, you're never going to get mine!" He was so good, that it took many players to get the puck from him! Joe was a mentor and coach to many local hockey players; Tech players and locals still talk about Joe playing with them after practice. Into his 80's, Joe was still skating twice a week at noon time with the seniors, at the Dee, and still hit his boxing punching bag several years after that, keeping in shape from his boxing and baseball days. Joe always had great stories to tell; he was quick to break into song verses or credit his good health to his "Croatian vitamins." For many decades, Joe has been a hockey supporter in this area for both youth hockey and Michigan Tech University hockey. Because of the contribution Bukovich made to Tech hockey, he received an honorary varsity hockey letter from MTU in 1975. 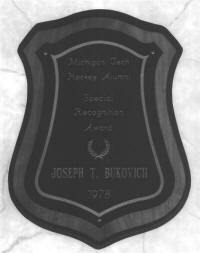 In 1978, the hockey alumni honored him with an Award of Recognition at a dinner banquet. As part of the Copper Country Hockey Centennial project in 2004, Joe was interviewed by the Keweenaw National Historical Park; this interview tape is in their archives. 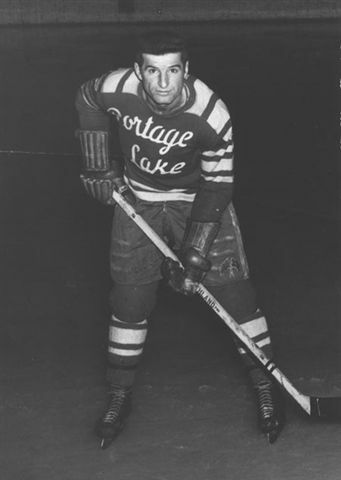 Mike Bukovich, (1919-1993) born in Painesdale, played with his brothers, Joe and Tony with the Portage Lake Team. Mike was a great stick handler. He was playing with the Painesdale hockey club by the time he was just 15 and by age 17 was a full-fledge member of the team. In 1946-47, Mike and brother Joe, played with the Duluth Coolerators. Anthony J. "Tony" Bukovich, born August 30, 1915* in Painesdale, died December 19, 2009 in Hancock, Michigan. Tony played hockey on the local Painesdale and Houghton teams, winning the MacNaughton Cup twice on the Painesdale team in 1935 and again in 1937. 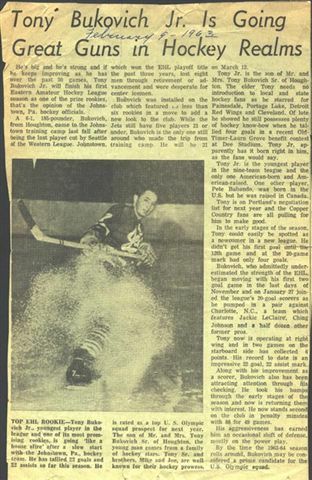 Tony moved to Detroit and was playing for amateur teams, with several other Copper Country players (Bernie Ruelle and Rudy Zunich) when a Red Wing scout signed Tony in 1942. 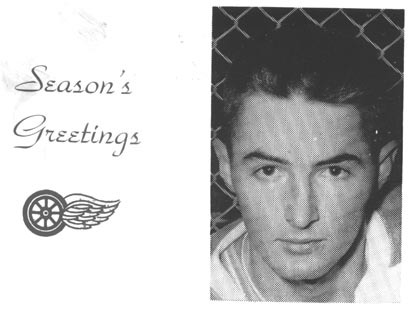 Tony had the opportunity to play winger for the Detroit Red Wings (1943-44, 1944-45). He played 17 games with the Red Wings, scoring 7 goals and 3 assists, wearing jersey number 2. Tony was dropped from the Red Wings roster to make room for a new player to the organization: a 6 foot, 18 year old called Gordie Howe. 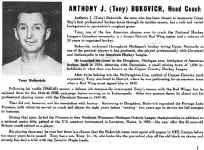 From 1943-47 Tony continued to play pro hockey; he played on and off for the Indianapolis Capitols and in 1947-48 for the Minneapolis Millers and the Cleveland Barons. Tony was playing for the Cleveland Barons when they won the coveted Calder Cup, as American Hockey League Champions that year. 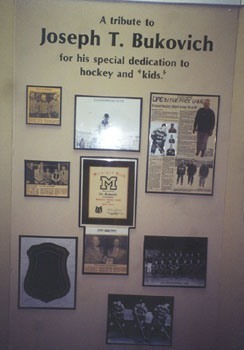 The original plaques starting in 1938, from this Cup including Tony's name, is displayed in the Hockey Hall of Fame in Toronto. 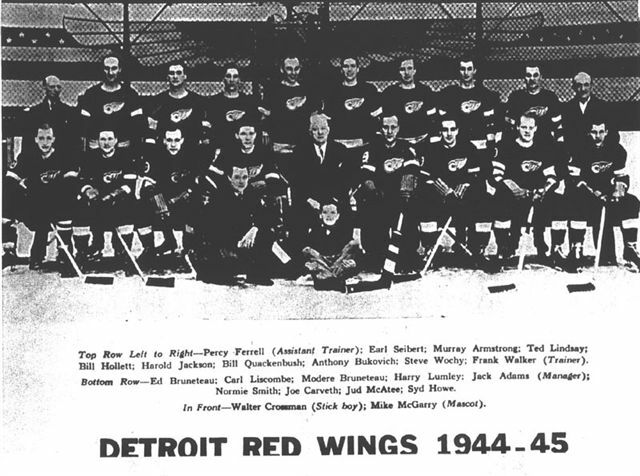 After that he returned to Houghton and reorganized the Portage Lake Pioneers as a player/coach. Over the next eight years, he lead the Pioneers to four Northern Wisconsin-Michigan-Ontario League Championships; and in his final year here, he coached the Pioneers to a National Championship Title in 1955 at the U.S. Amateur Tournament in Lewiston, Maine. 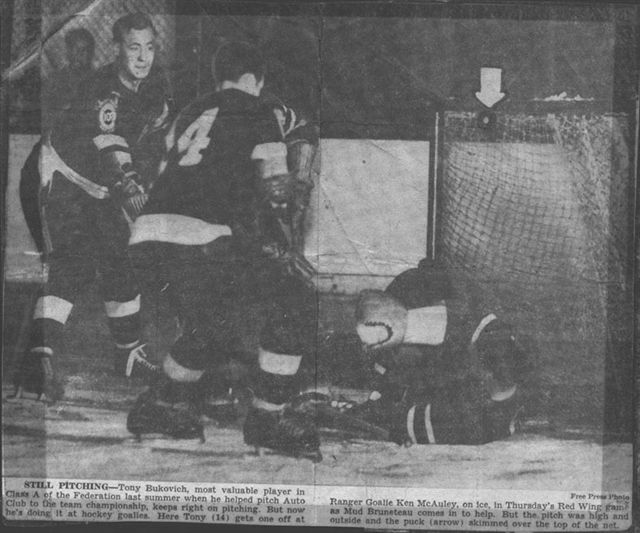 On March 23, 1952, the Pioneers beat the Marquette Sentinels 12-2 in the playoff game for the Gibson Cup, with player/coach Tony Bukovich scoring 8 goals in this game! 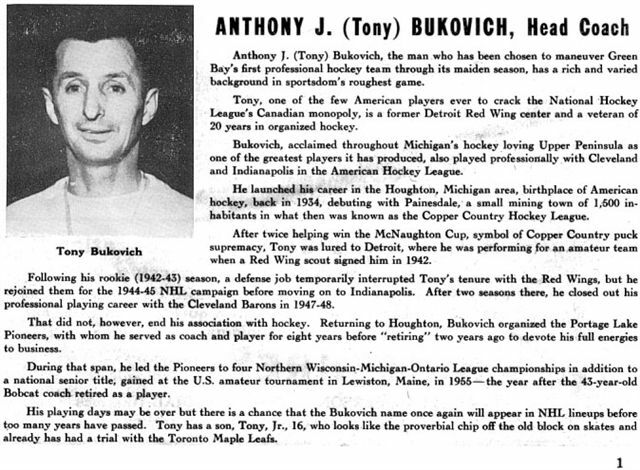 In 1958, Tony Bukovich become the first Coach of the Green Bay Bobcats, the first professional hockey team in Green Bay. Tony was inducted into the UP Sports Hall of Fame in 1975. Tony was also an amateur baseball player; Tony led the Detroit Auto Club to the 1942 World's and St. Joseph to the 1948 U.S. Baseball Congress titles. When Tony died Dec 19, 2009, he was the oldest living Red Wing player and one of the oldest living NHL players in the U.S. *Tony is listed as born in 1916 in game programs over the years but his daughter says his birth certificate indicates he was born in 1915. 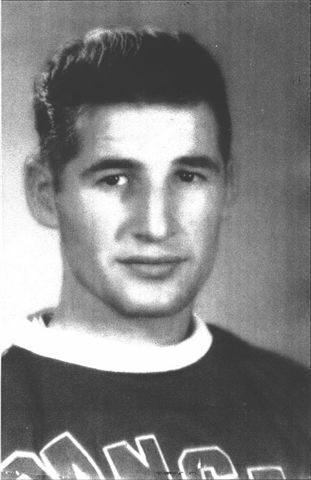 Tony Bukovich, Jr. born 1942 in Painesdale, played 3 seasons, 1962-65 for the Johnstown Jets, Pa. A newspaper article dated Feb 9th, 1963, captions his picture with: "Top EHL Rookie - Tony Bukovich Jr., youngest player in the league and one if its most promising rookies... He is rated as a top U.S. Olympic squad prospect for next year." 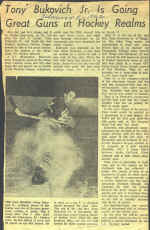 The article goes on to say Tony Jr at 6'1" 185 pounds... is the only American-born and American raised player in the 9 team Eastern Hockey League and ... Tony is on Portland's negotiation list for next year... on January 27, 1963 he joined the league's 20 goal scorers as he pumped in a pair against Charlotte, NC, a team which features Jackie LeClaire', Ching Johnson and a half dozen other former pros." For the 1965-66 season, he played for the New Haven Blades. Tony then played center for the first professional hockey team in Green Bay, the Green Bay Bobcats, for 3 seasons 1966-1969. His father, Tony Sr. coached the team their first year. Tony Jr. had a try out with the Toronto Maple Leafs before playing with the Bobcats. Joe Burcar born 19-- in Hancock, played High School Hockey for Houghton when they won the State Championship in 1982. He coached Marquette's Peewee AA team to a UP, State and National titles in 1993; coached the Marquette Electricians Midget AAA team 5 seasons 1994-99 when in 1995 they won the State title and finished 3rd in the Nation; he was the Asst Coach for two seasons at Houghton High School 1999-2000. In addition, he coached for 3 summers in the Select 16 and 17 USA hockey festivals; 2 years as assistant with Michigan 16 team winning Gold 2001 and serving as Head Coach of Michigan 17 team taking Silver in St. Cloud, MN. Joe coached the Finlandia University Mens Hockey team 2001-November 2009.
need pics of Joe in uniform here!